Urbani_T will include more than 30 performances and installations that showcase the work of hundreds of designers, DJs, artists and performers. 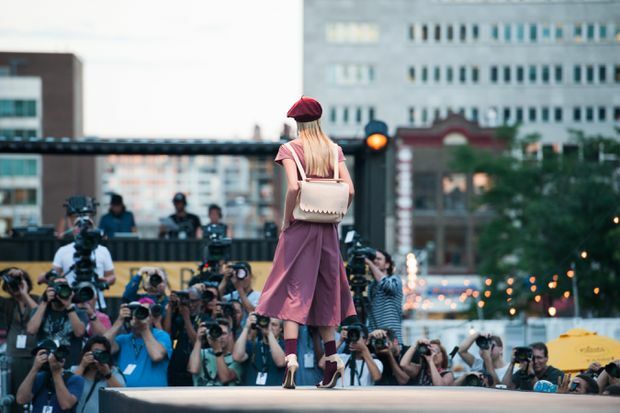 A Montreal-based fashion organization is launching a new festival in Toronto. From May 17 to 19, the Urbani_T Public Playground for Urban Culture & Creativity will take over Nathan Phillips Square. The outdoor event aims to bring some of Canada’s top creative talent out of the studio for three days of family-friendly programming. Presented by Groupe Sensation Mode, Urbani_T will include more than 30 performances and installations that showcase the work of hundreds of designers, DJs, artists and performers. A custom runway built atop the square’s reflecting pool will see presentations by fashion retailers Simons and Dynamite as well as a finale group presentation called Playground. Selected by Groupe Sensation Mode, Playground will feature looks from about 20 designers from Montreal and Toronto including Narces, Ève Gravel and Marie Saint Pierre, who recently won the Womenswear Designer of the Year prize at the 2018 Canadian Arts and Fashion Awards. For Chantal Durivage, vice-president at Groupe Sensation Mode, creating opportunities to engage with shoppers is at the core of Urbani_T. “We really want to create a conversation between the public and the different artists so the people can express themselves when they come to Urbani_T and then the artists are also giving them ideas that they can integrate into their lifestyle,” she says. To that end, Urbani_T will be hosting a pop-up market of about 30 designers. For younger visitors, the Design Exchange is putting on a kid’s upcycling (repurposing discarded materials into new products) workshop, and there will also be food trucks on site. Urbani_T will also host daily panel talks on a variety of topics, including one between Jeanne Beker, Urbani_T’s associate creative director, and Toronto fashion bloggers Sam and Cailli Beckerman and a separate panel on inclusivity, hosted by Fashion Talks podcast host Donna Bishop and featuring Sage Paul, Hayley Elsaesser and Adrienne Wu.